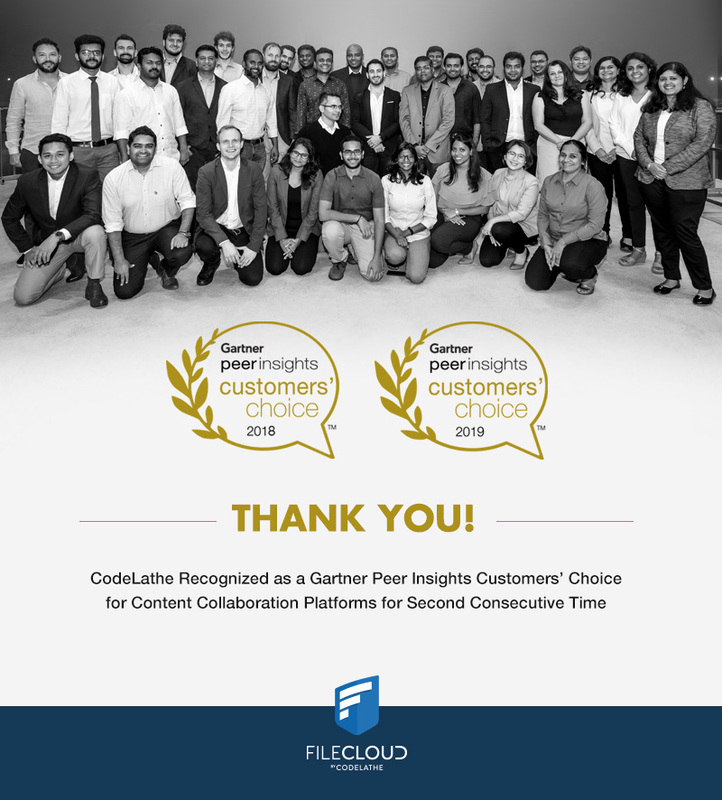 FileCloud, is excited to share that they were named an April 2019 Gartner Peer Insights Customers’ Choice for Content Collaboration Platforms (CCP). FileCloud has been recognized a second consecutive time for their single platform that enables collaboration and file sharing by their customers. Gartner defines the Content Collaboration Platforms market as a range of products and services that enable content productivity and collaboration aimed at individuals and teams, inside or outside an organization. CodeLathe’s FileCloud has received more than 100 reviews from end users, garnering an average score of 4.7 on a scale of 1-5 as of April 18, 2019. “Our Users Love The Accessibility, Our Business Loves The Control! Filecloud has been an awesome tool for us as we need to keep tight control of our data but have to make it accessible for our users. It has the same touch and feel of any cloud storage provider but sits on our infrastructure. Best of both worlds for our business and our users.” said IT Manager with a large ($1B+) services company. Read the full review at Gartner Peer Insights. FileCloud has more than 1 million users across 90 countries and works with organizations such as NASA, U.S. Army ERDC, Swiss Federal Institute of Intellectual Property and the United Nations Environment Programme that have specific requirements on data ownership, manageability, security, monitoring and regulatory standards. To read more reviews of CodeLathe FileCloud, visit their page on Gartner Peer Insights. You may have heard about virtual desktop infrastructure (VDI), and you’re wondering how it works and whether your company needs it. VDI has the potential to positively affect every part of your business – from coordinating the duties of your employees to improving customer relations. It comes as no surprise that many companies – both big and small – are opting for VDI. According to a report by Allied Market Research, the value of the market for VDI will climb to about $10,154 million by 2023. Small and medium-sized companies are expected to drive this growth. If you are still on the fence about this technology, then this article was created for you. We’ll look at some common problems in the workplace that VDI can solve. But before that, I must give you an overview of VDI technology. Typically, companies have different devices which employees use. These devices may be linked to the same network, and workers send information to one another via network sharing, email, and even the cloud. With VDI, it is entirely different. Yes, your employees would continue using different devices, but with shared resources. Let me explain. At the heart of any VDI network is the data center which contains a powerful computer. Now, you install the VDI app on this computer, and it creates a virtual desktop which your employees can access on any device. But this is not just an image of a desktop. It also gives them access to the hard drive and processing capacity of the device in your data center. Essentially, everyone in your organization would be using the same computer. One of the key advantages of VDI is that your employees can access the network anywhere and anytime. 1. Security: VDI is the ultimate security solution for any organization. We live in a world where we have to deal with a perpetual threat of getting hacked. With the bring your own device (BYOD) trend, the chances of this are even higher. Not to mention instances when companies hire outside contractors to handle specific tasks. There seems to always be a window that hackers can capitalize on to access your confidential files. However, with VDI, you never have to worry about that. First off, when your workers are using your VDI platform, no document is stored on their devices. Also, their connection to the VDI network is encrypted at all times. So, even if your worker is browsing on an unsecured network, you have nothing to worry about. At FileCloud, we encrypt your data while at rest and in-transit. We also have an inbuilt ransomware scanner, and you can integrate FileCloud with your antivirus. Since VDI eliminates security threats, you can save money by encouraging the BYOD culture. 2. Flexibility: Flexibility in the workplace can refer to different things. However, in this scenario, we’re referring to the flexibility of allowing your employees to work from anywhere and use any device. As much as we would love to, we can’t control the weather. And it often happens that employees may be unable to reach work on some days due to bad weather or even a personal emergency. Under normal circumstances, this may affect your overall productivity. However, with VDI, your employees can log into their work station from anywhere and complete their tasks as though they were present at the office. VDI also allows your workers to switch to any device and continue their work without any issues. This is particularly useful in fields like construction. Instead of having your engineers walking around with sheets of papers to access vital information and take notes, they can sign in to your VDI platform on mobile devices like a phone or tablet and use it instead. Not only does this save time, but it also improves efficiency. 3. Record Keeping: It can be a challenge to keep track of the activities of your employees and maintain corporate data. This job can be so complicated that you may have to hire one or two people to focus on it. Record keeping is vital in many fields like finance. State-owned companies are also required to have a record of their data. Instead of having to scramble around at the end of each month to gather files, opt for VDI. Since everyone’s data is saved on the same hard drive in a VDI network, it is much easier to dig up any file that you may need. FileCloud allows you to add metadata to each file, so searching for them is faster. 4. Collaboration: It is not easy to get people working together smoothly like the cogs in a machine. Not only is communication an issue, but workers also have to continually send files between one another. If you have tried sending large files over email or the cloud, you know it can sometimes be a pain to upload them. 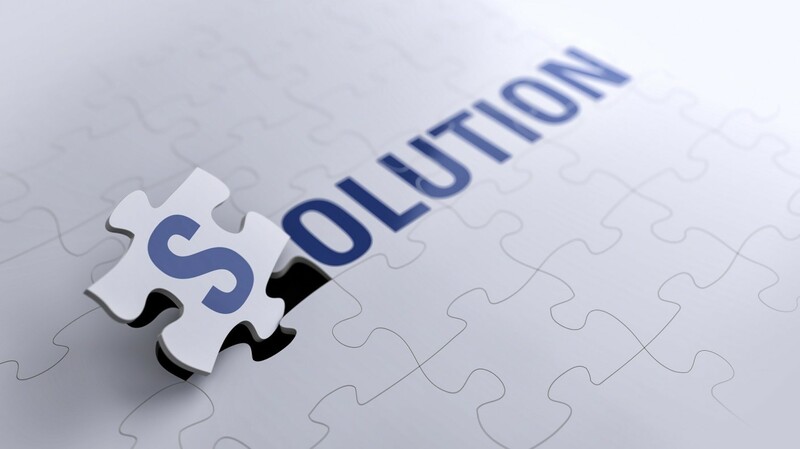 VDI solves all these problems and promotes seamless collaboration. There is no limit to the size of the files you can upload on FileCloud. Our platform also allows your workers to leave comments on files and have conversations with their colleagues about the work at hand. That’s not all; we provide an activity stream so each user can see who has accessed a particular file and the changes made. There’s also the option to receive a notification when changes are made to a file. As a result of the features mentioned above and more, FileCloud guarantees smooth collaboration in your workplace. Shifting to VDI can completely change how things work in your organization for the better. It will not only allow you to save time but also save money and boost your security. Whether you are a small or large company, there are so many ways that VDI can benefit you. Don’t believe the myth that VDI is expensive. That is archaic wisdom. Today, it is possible to shift to VDI without spending a lot of money. For only $10 per month for each user, you can have a VDI network up and running with FileCloud – and you do not even have to set up a server or data center to host your files. If you choose to use your server, the rate is as low as $4.20 per user monthly. It doesn’t get any better than this! Alternative to Nextcloud – Why FileCloud is better for Business File Sharing? Now let us look in detail, the area of differences between FileCloud & Nextcloud. Feature Integration: Nextcloud depends on their app integration to provide a complete set of features. Due to the nature of integration, the access to simple features are not intuitive. On the other hand, FileCloud’s feature integration was seamless and mimicked a typical SaaS application. Moreover, the built-in tightly integrated features will help enterprises manage users and servers very easily. Installation & Setup: Nextcloud’s setup was pretty straight forward. However, the application was bare out of the box. And, Nextcloud’s half-baked platform/app model didn’t help. FileCloud’s installation & setup was as easy as Nextcloud and will satisfy any enterprise that is in the market for an EFSS solution. The feature packed FileCloud solution was easy to get it up and running full-fledged. Multi-Tenant: For Managed Service Providers and larger organizations, having a multi-tenant capable solution is a must. FileCloud provides multi-tenancy and Nextcloud does not. Remote Block/Wipe – Administrator can selectively block a specific client device from logging into the FileCloud server. In addition to blocking a client device from logging in, administrator can also wipe FileCloud folders in the remote device. Device Commands and Messaging – Ability to send on-demand messages to any device connecting to FileCloud, provides administrators a powerful tool to interact with the enterprise workforce. Any information on security threats or access violations can be easily conveyed to the mobile users. Administrator Dashboard: FileCloud’s administrator dashboard provides a single page view of server health, user statistics, license information, disk usage, Geo-IP reporting and new user/file additions. File & Folder Locking: For seamless collaboration, the ability for users to lock files and folders are a must. FileCloud provides the ability to lock files & folders, in some cases automatically locks the file on edit. NextCloud doesn’t provide locking support. The management of information within the enterprise is changing, as businesses become more mobile, engaged and open. In a nutshell, EFSS refers to a service that enables users to store their files in the cloud or on premise storage and access them remotely via web browser or mobile devices. ECM on the other hand can be defined as systematic processes that enable businesses to store, search and deliver crucial content efficiently and effectively. Today’s enterprise IT has to balance between an end user’s desires to have an ‘easy to use’ solution that works on all their devices with a broader strategy that enables them to effectively build and disseminate information. Does flexibility win over control, or does compliance requirements trump ease of use? When consumer cloud storage services emerged, users were immediately drawn to their simplicity, the intuitive user experience they provide, their remote accessibility and the ease of collaboration and sharing they provide. Workers all over the globe were quick converts mainly because they had grown tired of the bulky, difficult-to-use proprietary enterprise content management systems. Consumerization enabled employees to define how, when and where they wish to interact with corporate content. Shortly after, companies began to see the value of moving their various apps to the cloud. It is this disruption that has prompted some vendors and analysts to wonder weather EFSS tools can replace traditional enterprise content management solutions. Its no secret that file sharing and sync services have emerged to challenge conventional ECM software. However, whether or not the rise of file sharing services in the enterprise spells doom for enterprise content management applications is still a subject of debate. While EFSS is largely focused on collaboration, user experience and speed, ECM is focused on control, security, and compliance. Content management platforms were build for a vast range of purposes, facilitating the control and capture of content throughout its life-cycle. They therefore tend to offer more robust features, including tighter security, work-flow controls and security. Despite their robustness, today’s workforce has demonstrated time and time again that they want easy-to-use applications that provide them with remote, 24/7 access, regardless of their location. While some enterprise content management application vendors may maintain that file-sharing and sync applications are lacking in certain avant-garde functionality like permissions and security, work-flows and audit trail; EFSS has come along way. ECM vendors have begun noting the success of file sharing and synchronization. This has prompted them to start adding EFSS-type functionality to their content management platforms. But it may be a case of too little to late, EFSS tools have already gained wide acceptance in the enterprise. Some of the EFSS tools currently in the market have enough functionality to be classified as ECM apps; making them the ideal choice for both on-premise traditionalists as well as those who simply wish to leverage mobility and cloud to transform their business. With added compliance capabilities and security, enterprise file sharing and synchronization not only provide access to data stored in their dedicated remote repositories, they also facilitate secure access to data stored in on-premises network drives. With EFSS, you would essentially be getting an ECM platform with more collaboration features at a fraction of the cost. File sharing and sync tools may not be a direct replacement for ECM entirely, but they will certainly eat into some of the use cases. In the long run, file sharing solutions with directly compete with established ECM solutions. Click here to see the robust features FileCloud offers and click here to see how it stacks up against other file-sharing tools currently in the market. AUSTIN, TEXAS – September 28, 2016 – CodeLathe, the leading provider of Enterprise File Sharing and Sync platform, announced today the immediate availability of FileCloud 13. This new version offers powerful features to protect enterprise files from ever growing ransomware threats. “Ransomware is the No.1 cyber security threat faced by enterprises today,” said Madhan Kanagavel, CEO of CodeLathe. “Ransomware protection should be a key requirement for an enterprise file sharing product. Undoubtedly, FileCloud offers the most powerful ransomware protection features among EFSS products. More than ever your files need it”. What is Ransomware? Why do EFSS solutions need built-in protection? Ransomware is a type of malware that encrypts digital files and removes originals forcing the enterprise to pay ransom to unlock the data. The victims of ransomware range from schools, hospitals, police departments, SMEs to large enterprises. Enterprise File Sharing and Sync (EFSS) solutions can exacerbate the ransomware problem. Since EFSS solutions provide endpoint agents that access, synchronize, backup data from and to central repository, the risk of infection increases a lot without adequate protection. Sync and backup applications will end up synchronizing encrypted file rendering backed up data unusable. Public cloud EFSS providers such as Dropbox, Office 365, and Google Drive are a favorite target for ransomware and they provide an attack vector into end user computers by delivering malware payload via spoofed email messages. Recent security breaches in Dropbox (68 million accounts), Adobe (38 million accounts), LinkedIn (117 million accounts) and Yahoo (500 million) further exacerbates the ransomware threat. How does FileCloud Protect Enterprise Data from Ransomware? File Content Heuristic Engine – To protect data from ransomware attacks, FileCloud 13 has incorporated a file content heuristic engine to find, and protect files from attacks. Heuristic engines can detect unwanted types file based on its content signature. If the detected file type does not match its mime type, then a variety of actions can be setup to keep the ransomware from spreading. You can read more about FileCloud content heuristic engine and how it protects your files from ransomware our site. Granular permissions to prevent writes to sensitive data – FileCloud 13 supports ACLs to allow custom permission for the file resources. Using granular permissions, organizations can build permission tree to protect sensitive data. Therefore, even if a folder is exposed via Drive or Sync clients, the client cannot modify the folder data preventing any infection risk. Recovery from ransomware – Backing up and versioning of files can be effective mechanism to recover from a ransomware attack. In the event of a ransomware attack in a client computer, if the data had been versioned in FileCloud server, then the client computer data can be restored using older versions from the server. FileCloud offers unlimited versioning, endpoint backup and rollback scripts to help companies develop effective anti-ransomware strategies. Customization is an effective deterrent – Email spoofing is one of the primary delivery method to send malware to end user computers. With Dropbox and other public SaaS products, hackers can easily spoof the email and users aren’t usually aware of what is behind a link because every email and link look the same. Filecloud offers an array of custom branding options for UI, business domain, and email templates to login page image. FileCloud 13 is available for immediate download from our customer portal. For complete list of new features please check our FileCloud 13 launch blog post. Currently, FileCloud is used by Fortune 500 companies; Global 2000 firms; world’s leading law firms; city, state and federal institutions; world-class universities; and renowned science and research organizations. FileCloud is deployed in over 90 countries. FileCloud also has more than 100 VARs and Managed Service Providers across the world. While working on publishing version 4 standards of the Transmission Control Protocol and Internet Protocol (TCP/IP) in the late 1970s and early 1980s, developers were able to run a series of experimental development work which later on led to the creation of modern TCP/IP. Through this ground breaking innovation, the developers were able to further their work and divide methods of network use into two categories. The first category was the direct network use which allowed users to access remote hosts and use them as though they were local. One such application was Telnet. The second method of network use was indirect use which allowed users to get resources from a remote host and use them on a local system then transfer them back to the remote host. One such application was FTP. Initially created to simply transfer or share files within a network, FTP developers found it necessary to improve their innovation. This is why the initial FTP standard, RFC 114 was improved from just a definition of basic commands and how devices could communicate using the protocol. A series of upgrades through to RFC 172,265 and 354, ultimately led to a more secure FTP that required users to use usernames and passwords before they could share or retrieve files. As much as developers tried to secure the file sharing solution by adding a secure extension, FTPS, FTP users still come across a number of security and efficiency issues. FTP usually has a 2 GB limit to the file size you can send or share, making it inefficient for businesses that usually deal with large file sizes. Worse still, in the event you send any file and it fails to deliver, FTP does not notify you of the failure unless you manually check for it. Additionally, you cannot run simultaneous transfers to multiple recipients, making this a time-inefficient file sharing solution. In the wake of Snowden revelations on the spying activities of the United States government and the formulation of new server operation regulations, you sure want your company to comply with set industry regulations. Sadly, while your company would want to be compliant with different set of regulations, FTP vendors don’t offer consistent compliance with different regulations. From the start, FileCloud was ideal for businesses that valued security and data ownership. Data ownership is enhanced by the fact that the software empowers corporate IT departments and MSPs to create their own, secure file sharing and sync platform. FTP offers no traceability at all while FileCloud developers have ensured that any file activity or action, however small, can be traced. For example, in FileCloud 8.0, users can use the activity stream feature to review any action taken on files and folders saved on FileCloud. You can monitor actions such as document uploads, downloads, updates and sharing within your team, for example. File editing has never been easier before. FileCloud, through the file comments feature, helps enhance team communication and collaboration. For example, any comments added to a file sent for review will be displayed, showing who commented, what they said and when they did it. Additionally, the quick document feature allows you to quickly incorporate the comments and edit the document accordingly then save the new version, without downloading or uploading anything on the FileCloud server. FileCloud offers better security than FTP, no wonder it is trusted by 2000 global enterprises across industries, in 90 countries. If you are looking for a secure FTP replacement, click here to learn more about FileCloud – a modern alternative to FTP. Try FileCloud today and begin enjoying features that FTP does not offer you. AUSTIN, Texas, August 9, 2016 — CodeLathe, the provider of FileCloud, the IT industry’s most innovative Enterprise File Sharing and Sync platform, announced today the immediate availability of a FileCloud extension for users of Google Chrome and Gmail. This new and amazingly easy-to-use extension enables users to share large files and save email attachments directly to FileCloud without leaving the Gmail window. By using the FileCloud for Gmail extension, FileCloud users can now easily share and save files just by clicking the FileCloud icon on the Gmail window. FileCloud is the leading, self-hosted file sharing, sync and mobile access for businesses. FileCloud is deployed on in-house servers or on cloud infrastructure providers like AWS, Azure or Google Cloud. FileCloud client apps are available for the leading desktop and mobile operating systems such as Windows, Mac, Linux, iOS, Android, Windows Phone 8, and now Chrome. According to Litmus Email Analytics, Gmail holds the second largest market share (16%) in email clients and Chrome Browser is the undeniable market leader in browser market with 50.95% market share. Among the many reasons for Chrome’s popularity is that it has one of the largest libraries of extensions and add-ons that enhance the browser’s ability to do what you want it to do. The FileCloud for Gmail extension is particularly useful for organizations who use Gmail for their organizational email. The extension is simple, but gets the job done in a few less clicks. 1. Install the extension in your browser. Once the extension is installed, you’ll see a new FileCloud icon at the bottom of the message compose window. Click it to sign in and select files from your FileCloud. The extension then adds links to your email message and they’ll get shared with the recipient. One can also choose files instead of sending links. 2. You can also save Gmail attachments directly to FileCloud by clicking the FileCloud icon. The email attachments are automatically uploaded to your FileCloud target directory that you specified. 3. You can quickly find files by using FileCloud search tool and add them as an attachment to your email message. FileCloud for Gmail extension can be downloaded at no charge by visiting Chrome Web Store. FileCloud is currently used by more than a thousand businesses across 65 countries including world’s leading universities, research organizations, government entities, and enterprises. For more information or to download FileCloud, please visit www.getfilecloud.com. FileCloud is a leading enterprise file access, sync and share solution that provides flexibility to run on-premise or on any IaaS such as AWS, Azure. FileCloud not only has the ability to integrate with cloud storage but also make legacy storage available through its access framework. Additionally, using FileCloud, users can search for files/folders by name, type, date and size across any storage connected to the system. Furthermore, in v12 release (Q2 2016), FileCloud has increased its search capability by introducing the ability to search files based on its content. 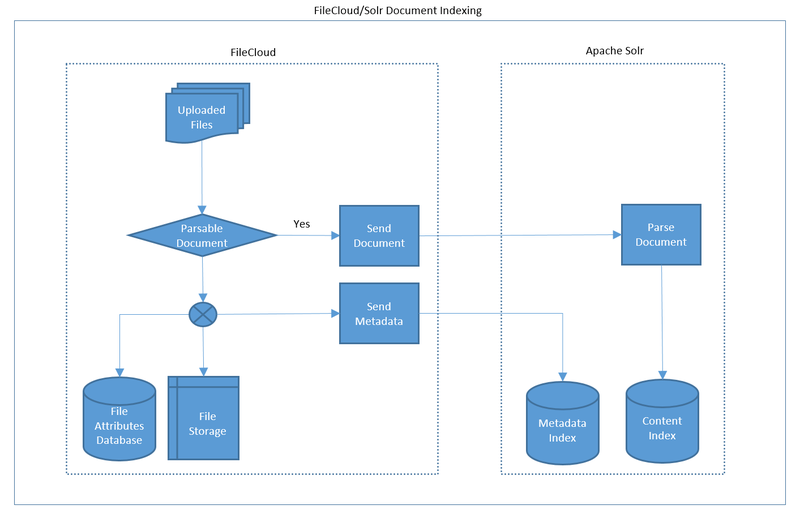 Under the hood, FileCloud uses Apache Solr for searching file contents. 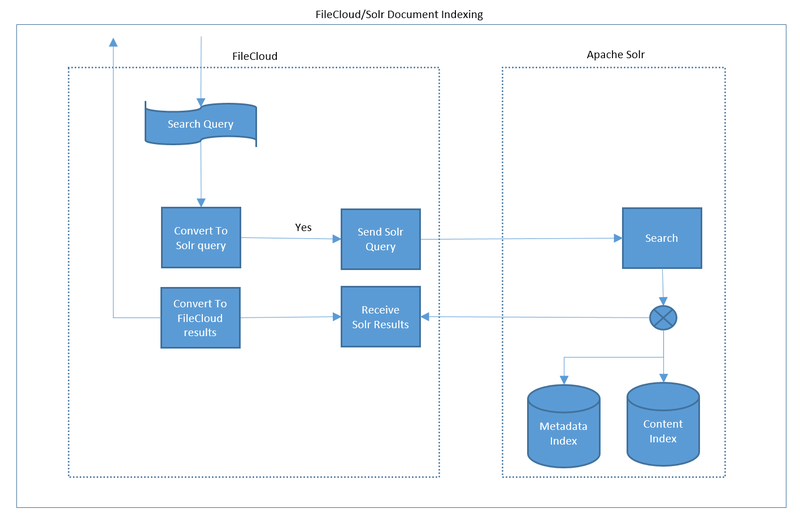 This blog explains the interaction between FileCloud and Solr to make content search possible. Solr is a highly reliable, scalable and fault tolerant, providing distributed indexing, replication and load-balanced querying, automated failover and recovery, centralized configuration and more. Solr powers the search and navigation features of many of the world’s largest internet sites. Solr is a java application that is packaged with all the components to run it as a standalone service or in a cluster. Please look here for installation instructions. FileCloud can be configured to use Solr as a service to be used for content search. Please look here for configuration instructions. Once FileCloud is configured with Solr, all the uploaded documents (content searchable such as DOC, DOCX, XLS, XLSX, PPT, PPX, PDF, TXT) are indexed by Solr. Indexing of documents and storage of the indexed information. Querying the index to retrieve files that match the query criteria. FileCloud server checks if the incoming document is a parsable document such as word documents, spread sheets, presentations, plain text files and PDF files. If the document in not parsable, it is processed and stored in FileCloud. A copy of metadata of the document file is send to Apache Solr, which in turn gets stored in the metadata index. The metadata sent to Solr includes file attributes such as name, path, size, creation date etc. Storing this information in Solr enables FileCloud to retrieve files based on these attributes in addition to content. If the document is parsable in addition to processing and storing in FileCloud, a copy of the document is uploaded to Apache server. Metadata of this document is also sent to Solr. When a parsable document is uploaded to Solr, it parses the document, extracts the text contents and stores the information in the content Index. Client such as web UI sends search parameters to FileCloud server. The parameters can be some text string to be searched inside the files and/or name, path, size etc. FileCloud server parses the incoming parameters and converts them to a query format the Solr can understand. Solr query is then submitted to Solr. Solr executes the query on the metadata and content index. The results are collected and sent back to FileCloud server. FileCloud server converts the search results into a XML format understandable to FileCloud clients and sends the result back to the client. With Windows Server 2008 Microsoft is bringing back the Nano Server trend. This is a bare-bone structure which is just enough to deploy the 2016 version of Windows Server. This is not a new option, but use of Nano Servers for deployment has a much smaller impact than server core deployment. Imagine a server without any form of user interface – Microsoft is all set to introduce its Windows Server 2016 without any UI and this includes PowerShell. Owing to its small size and very small deployment, the Nano Servers have extremely limited applications. Although Microsoft recommends the use of Nano Servers for host Hyper-V, running could applications and scaling out file servers only. Creating backup of Windows Server 2016 will not be impossible, but it will definitely require extensive planning. In most cases the Nano Servers are expected to run as VMs. In such cases a virtualization aware backup app compatible with Windows Server 2016 should be enough to backup all necessary data on a regular basis. In case of guest level backups, suitable backup agents with increased compatibility will be required to be incorporated into the deployment image of the Nano Servers of 2016. P.S – always remember that Nano Servers can be installed from deployment images only. Containers weren’t available for Windows currently besides the fact that they will be Docker containers which have been made compatible to work with all new versions of Windows. Since this is a fairly new technology, it is expected that most backup vendors will not have a good solution that handles all kinds of container backup and related problems. This will be an initial stage problem which will be resolved with time. However the ones who make the initial switch to Windows Server 16 will face issues during server backup. Organizations which have been using Docker for a while prefer Linux servers. These organizations usually use scheduled codes to back up their Docker containers in the form of .tar files. These can be backed up without any hassle like other file formats after they have been created. Microsoft has been trying for quite a while now to offer Windows as a Service. 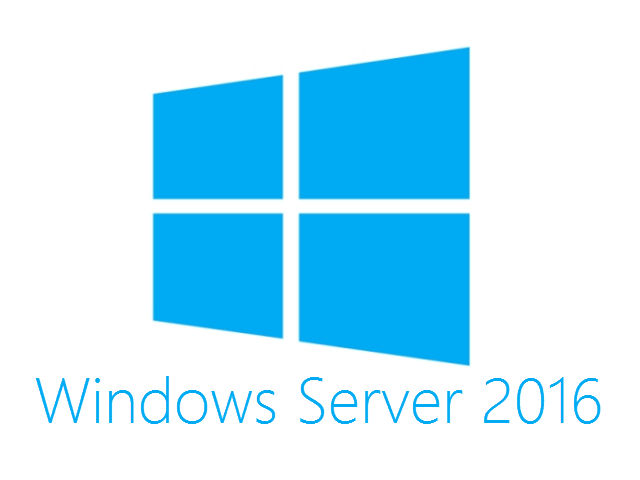 This is about to come true with Windows Server 2016. If we look back we can see that Microsoft actually has quite a long and uninterrupted history of offering regular updates for Windows desktop and Windows Server to complement each other. This basically means the unique property of Microsoft to offer regular updates, features and editions to all the Windows users over a period of time. If the Windows Servers include such services then the backup operators need to be equipped with extensive new features that will perform regular testing of new builds. This is primarily necessary for auto-updating OS which add and change elements intermittently. Storage Space Direct is one of the most recommended scalable storage systems for local servers. This is a fairly new concept and has been optimized to function with Windows Server 2016. Hence it requires a little bit of time and understanding to be able to use it to its highest potential. This will bring forth the use of a new generation of disk devices including SATA SSD and NVMe disk device. Most organizations do not have the infrastructure or familiarity to support the use of Storage Space Direct. The other concerns regarding the application of new storage models inlcude: The use of the new SSD technology enables the organizations and service providers to use simple industry standard servers with local storage systems to eliminate all kinds of complexity. It also removes the requirement of any kind of a shared SAS fabric which is a further unknown zone for most organizations which use shared local servers. The new backup agents require much more than just the ability to restore lost data. These new agents should be able to manage snapshots, DR elements, VM protection and Cloud Support in the event of server failure or system failure. However the use of Nano Servers and Docker containers may pose serious challenges for the backup process. In addition to these a number of other features need to be factored in, these include the server load, the size of the organization and the specific business requirements of the server in use. Hence, when it comes to server backup agents, one size never fits all. Those, who are switching up to 2016 version of Windows Server, may have to wait sometime before finding the right backup agent.